Explanation: With equipment frozen deep into ice beneath Earth's South Pole, humanity appears to have discovered a neutrino from far across the universe. 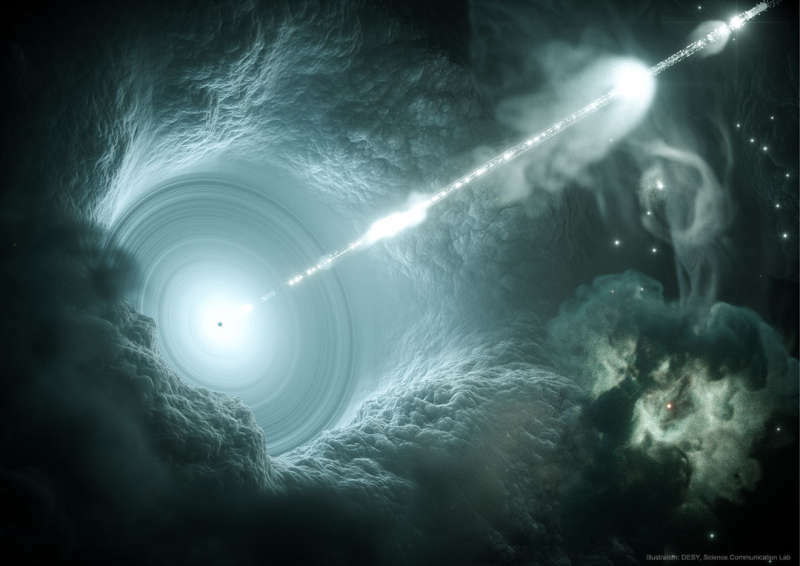 If confirmed, this would mark the first clear detection of cosmologically-distant neutrinos and the dawn of an observed association between energetic neutrinos and cosmic rays created by powerful jets emanating from blazing quasars (blazars). Once the Antarctican IceCube detector measured an energetic neutrino in 2017 September, many of humanity's premier observatories sprang into action to try to identify a counterpart in light. And they did. An erupting counterpart was pinpointed by high energy observatories including AGILE, Fermi, HAWC, H.E.S.S., INTEGRAL, NuSTAR, Swift, and VERITAS, which found that gamma-ray blazar TXS 0506+056 was in the right direction and with gamma-rays from a flare arriving nearly coincidental in time with the neutrino. Even though this and other position and time coincidences are statistically strong, astronomers will await other similar neutrino - blazar light associations to be absolutely sure. Pictured here is an artist's drawing of a particle jet emanating from a black hole at the center of a blazar.